Cracked Flashing, Broken Shingles, Ice Dams, and More! Franciscus Incorporated Can Repair or Replace Your Roof Today! Let’s face it: No one wants to have to go running for a drip bucket every time it rains. Not only is having to stay on top of the weather forecast annoying and impractical, but that one small drip symbolizes a larger roofing issue - and we all know that roofing issues mean an investment of time and money. 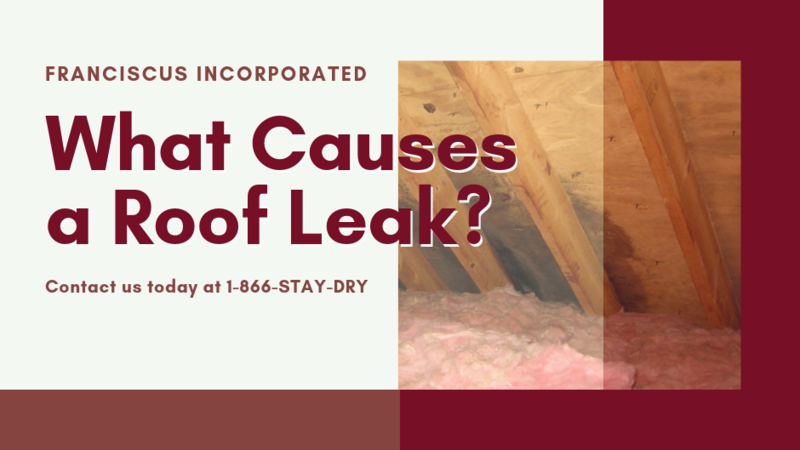 In an effort to save you that investment, we’ve found a list of "The 10 Most Common Causes of Roof Leaks." We’ll tell you what they look like and why they happen. Whether your roof is two years old or twenty, keep this list handy because you never know when it could mean the difference between doing a quick repair or a major remodel! Whether you have an old roof, new roof, or even a fancy green rooftop, wear and tear is unavoidable. There will be rainstorms, long winters, and heavy winds. But, roof leaks? They are a different story. With the right care regimen, every roof should have the ability to keep your family warm and dry for decades. As you work on home maintenance, refer to this list of the 10 most common causes of roof leaks. You’ll be glad you did when catching a leak early saves you time and money. And, if your roof is damaged, give our highly trained team members at Franciscus Incorporated a call today! We would be more than happy to assist you with ALL of your roofing needs and more!